This Easter we took the kids on a once in a lifetime trip to Florida and it was so good we're now hoping it wont be 'once' in a lifetime. The American food certainly was interesting, one day for breakfast at Egg City I had their City Mush, which was grits with cheese, sausage gravy, scrambled eggs and bacon. Now I just had to try and replicate it back at home, or even better in the van, but as we cannot get grits easily I've replaced them with polenta, which is probably the closest substitution. 'Sausage gravy?' I hear you ask, yep its a gravy made from sausages but don't knock it until you've tried it. I think this is great alternative breakfast, even if it is a bit unusual for us Brits. 1. Start with the sausage gravy by removing the skins and chop the meat into small pieces. 2. Put them in a pan on medium heat with a blob of butter and gently brown all over. 3. Reduce the heat then add the flour and mix well. The flour is mixing with the fat to kind of form a roux. 4. Pour in the milk and stir continuously. You will have to judge the amount of milk needed by eye but it should form a really thick gravy after about 10 minutes. Season to taste. 5. Now the polenta is pretty easy and you can follow the packet instructions or just put a handful of polenta into a pan with double the amount of water and bring to a simmer for about 10 minutes. Stir frequently and when its thickened add the butter and cheese and allow to melt. Season to taste. 6. Fry the bacon in a frying pan until crispy then set aside but keep the fat in the pan. 7. Scrambled eggs are easily done in the microwave in about a minute but they're also delicious cooked in the leftover bacon fat. Mix together your eggs then pour into the frying pan with the fat on a medium-low heat, stir constantly until done to your scrambled liking. 8. All that's left to do now is plate up! 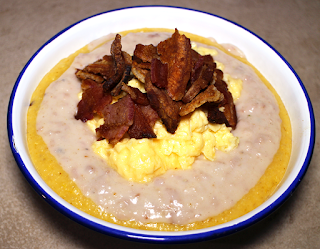 Pour the cheesey polenta into a bowl and top with the sausage gravy then the eggs and finally the crispy bacon. Enjoy..